Everyone’s home recording studio setup varies a little bit. Much of it is dependent on room size, budget, and what you plan to do with it. In a lot of cases, a laptop, audio interface, and a set of headphones are enough to get off the ground and into home recording and mixing. Other things like acoustic treatment and studio furniture are considerations if you plan to work on monitors with a desk designed for recording. The following are the barebones basics to get your home recording studio setup running! The computer is without a doubt the most important part of any home recording studio setup. It’s the “brain” of the entire operation; without it, few of the other components are of much use! Whether you prefer a laptop or desktop, Mac or PC, is less important than the specs of the machine itself. A fast processor with ample RAM is paramount. While quad-core processors like the Intel i7 can multitask better than dual-cores, a quick dual-core like a 2.9 GHz i5 can handle even very dense projects. It’s advisable to run at least 16 GB of RAM alongside it to ensure your computer’s viability as a music-making machine. While hard drives are increasingly becoming solid state, if yours isn’t, you’ll want it to run at 7200 RPM. The faster it can think, the smoother your sessions will perform! The computer will likely be the biggest investment in your home recording set-up and a place you wouldn’t want to skimp out on. Once you’ve settled on a machine, you can move on to software. The digital audio workstation (DAW) is the software you’ll use to record, edit, mix, and master audio, create MIDI arrangements, and perform anything else you can imagine. Everything happens in the DAW, so pick one and learn it well! Whether you choose Pro Tools, Logic Pro X (Mac-only), Digital Performer, Ableton, Cubase, Reaper, Garageband, or any other DAW, is up to you. Each is a viable option that performs the same set of basic tasks in a slightly different way. For reference, Pro Tools is the industry standard and excels at recording and editing audio. Logic Pro is a close runner-up, with especially great MIDI capabilities and a wide variety of incredible virtual instruments. It is Mac-only, however, which may exclude it from some users, though it’s also quite affordable relative to others. For now, don’t worry about expensive plugins. Every DAW has its own set of stock plugins that will get you up and running! The interface is a hardware component that connects microphones or other instruments to your computer. In the simplest sense, it provides I/O for your studio and sends audio signals to your DAW for recording, commonly via USB. For many home recording set-ups, two inputs are enough. The Focusrite Scarlett 2i2 is a popular option, featuring two preamps and hybrid XLR/TS inputs for microphones or line-level instruments. Focusrite even offers a beginner’s bundle, complete with headphones and a microphone! Beginners should consider investing in one or two “all-around” mics that suit their budget for their home recording studio setup. A large-diaphragm condenser can do just about anything, as can the awesome (and inexpensive!) Shure SM57: a popular workhorse dynamic microphone. Typically, condensers provide a more articulate frequency response, while dynamic microphones are robust and more tolerant of high-volume sound sources. If you’re a guitarist, you especially can’t go wrong with the aforementioned SM57 on a speaker cabinet. Vocalists, on the other hand, may prefer a condenser, like the Røde NT1–an excellent entry-level option. Consider what you’ll be recording the most and make a decision from there! Headphones will keep your neighbors off your back, and you’ll need them for tracking. Selecting a pair of studio headphones really comes down to taste and budget, but you can get yourself an industry standard for around $100 with Sony’s MDR7506s. Closed-back cans provide optimum isolation but aren’t as good for mixing, while open-back headphones give more airiness with less isolation; they’re better for mixing, but have less isolation for tracking. Monitors are preferred for mixing, but the size of your plays a major role in what you choose. For a smaller home recording studio setup, 5″ to 6.5″ drivers should be more than adequate. It’s also advised to try out front-ported monitors in tight spaces! When I think of studio furniture, I typically think of the desk. 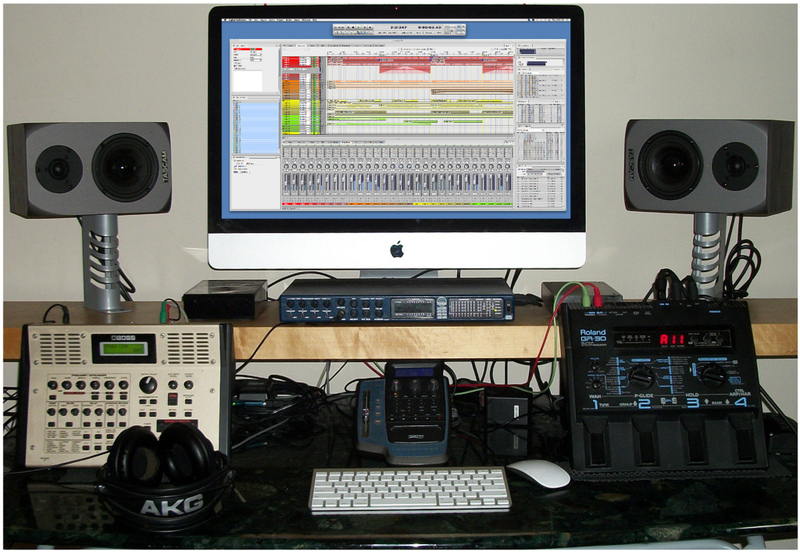 Many companies produce desks specific for recording, complete with elevated monitor platforms and built-in rack space. If you have the room for it, a studio desk is a great way to set up all of your equipment, including speaker monitors, computer monitors, any outboard gear you might have, MIDI controllers, etc. Even the largest desks can be space-savers when utilized effectively. The idea is to reduce clutter and create the most efficient home recording studio setup you can. Studio furniture excels at this! The importance of acoustic treatment cannot be understated if you plan to do any serious mixing in your home studio. The only way to make a “standard” room suitable for mixing–that is, one not designed and built for professional audio work–is to get acoustic treatment. For the average home studio, just treating the first reflections will do wonders for your environment. DIY panels are inexpensive and easy to make. From personal experience, I highly recommend working with denim insulation instead of rigid fiberglass. It’s much safer and easier to use, and is highly absorptive.